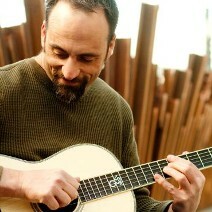 Pacific Northwest acoustic guitarist Eric Skye occupies a unique niche. Most often billed as a jazz guitarist, Skye actually plays in an eclectic and original style, with a range of influences from bluegrass, to blues, to vintage funk, even a little classical guitar… all threaded together with a healthy respect for the groove. Skye has been featured in magazines such as Guitar Player, Acoustic Guitar, Jazziz, Jazz Improv, 20th Century Guitar, and others. His music has been on National Public Radio and Public Radio International. He has performed and been interviewed on many live radio broadcasts in the United States and Europe, and has written and recorded music for public television. Skye has released several albums, most recently a solo guitar interpretation of Miles Davis’s seminal work “Kind of Blue”, entitled “A Different Kind of Blue”. Skye’s music style makes him a perfect fit for an outdoor concert at the vineyard. Visit his website, ericskye.com/ to hear a sample of his music and to read more about the man 20th Century Guitar Magazine calls “one of the best rising stars of the American acoustic jazz scene”. Doors open at 6:30 p.m., with music from 7:30 p.m. – 9:30 p.m.; seating is limited. Call Greenfield Vineyard and Winery (http://www.greenfieldvineyard.com/) at (405) 258-0525 for reservations. Tickets are $34.95 per person, and include heavy hors d’ oeuvres and a generous wine tasting. Beer is also available. Eric Skye’s CDs and a DVD “On the Sonoma Coast” will be available for purchase.